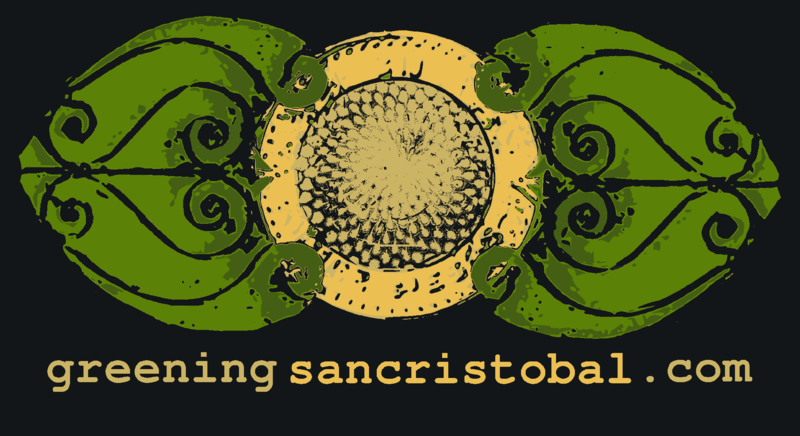 Greening San Cristobal is more than just a website. I know everyone says that, but this website extends the boundaries of the world wide web entirely in ways that are both novel and unique, and that place this project in another realm entirely. I'm excited to introduce you to Greening San Cristobal, a project that will encourage sustainable community growth by showcasing projects and people in a community that are focused for the betterment of a culture: social service and environmental organizations/NGOs, artisans and musicians, and outdoor spaces. Ultimately the goal of a community-based philanthropy is to give to a community in a way that encourages and sustains an economy of exchange. Whether that 'economy' encourages and educates a child to dream bigger (or dream at all), or it funds a micro-lending artisan's cooperative in an impoverished part of the world, or a program for inner-city youth, the heart of philanthropy is in the hopes of starting an engine that will fuel a community. In the last two years I have become intimately acquainted with various types of tourism. My travels have taken me through most of Mexico and Guatemala. Eventually, we settled in the highlands of Chiapas in a little town which we had traveled through at various points in our journey called San Cristobal de las Casas. The first three times I came through San Cristobal de las Casas, I was a traveler. My partner and I found ourselves part of a big demographic of travelers and tourists who want to experience a culture, it's projects, and all in a way that is conscientious and respectful. My experience as a traveler is that, if you are not with a program (which a vast percentage of us are not), the kinds of projects and information that as a demographic we are hungry for are simply not visible to someone who is passing through: whether it's for 3 days or 2 weeks. It was only after coming to stay here that we have discovered some amazing projects and people. Unfortunately, because they are not well positioned for tourists who, they do not have the kind of access to kind of traffic that would make a difference in feeding their various 'works' in the world. In the world of communications, networks and technology, 'Greening San Cristobal' is an engine that jumps starts sustainable and creative community development in a way that is biased towards local cultural entrepreneurs. by inviting a partnership with local hotels, restaurants and business 'members' whose participation will comprise the lion's share of the income for the project and who will each present and advertise the site the tourists/travelers who come in. Business 'members' will have their own profile pages with space for pictures, files, blogs, map information and information about any events they are sponsoring. A directory will enable easy location of businesses based on the services and goods they provide. Individual maps on the member profiles will provide users with the ability to find them. This is where most tourist oriented websites stop. Greening San Cristobal goes beyond by giving travelers and tourists access, not only to relevant business, but also showcases the profiles of countless projects, organizations and artisans whose presence in the community directly benefits the social and cultural good, and whom a great demographic of travelers seek. Access: particularly in regions with less economic development, this site gives artists and organizations very inexpensive access to having a well developed profile of their talents and services online. Membership: the gateway to participation is structured around 3 membership types: Businesses, Organizations and Artists/Musicians/Performers. While nominal entry fees are associated with Artist and Organization memberships, the Business members will carry a price tag that is comparable to the going rate for similar types of 'advertising', and which will fund the site. All the mechanisms for keeping track of memberships, donations and payments are built into the site. Promotion: Stickers, business cards, and fliers will be made available to all members in their interest to advertise for themselves and also for the project generally. Purchased Advertising: Blogs and other advertising can be purchased for the site, and non-profit organizations are given a volunteer signup and donate button that they can use. Translations: The 'formal' site (all content, profiles and pages) will exist in 2 main languages: Spanish, and English. There is also a 'Google Translate' button that, unpoetically, will translate in 56 different languages. The mechanism to pay for translations is built into the business strategy. Generous Wages: The business relationships are structured to give sales persons, translators and other employees a more than fair share of income that is generated (see below) in order to contribute directly to the local economy and workforce. Career Training Program: In addition, a training program will enable employees to quickly learn the program, and also enable the more ambitious to begin learning towards a career in technology through their day to day participation in adding to and maintaining the site. The purpose of this section is to serve as an open and transparent description of the business arrangements that greeningsancristobal.com makes with it's collaborators. Page one describes all of the current needs that greeningsancristobal.com has and is added to help each person collaborating to understand the various functions that are needed within the business and better understand how the big picture comes together and what place your role plays in this bigger picture. The payment and closure agreement on the second page makes clear to all involved the way that money will be divided amongst different types of collaborators, and how greeningsancristobal.com will manage the changing of staff. And on the last page, the specific process of a sale is outlined from the sale to it's input into the computer, to the payment of salespersons and staff. For the demographic this site aims to serve, there is no existing competition. TripAdvisor.com is widely used by travelers, but they do not include non-profit organizations or artisans, and they also do not have the inside scoop: for the most part, it's all written by other travelers/tourists, and none of their content focuses on what I would call conscientious tourism. In addition, San Cristobal de las Casas has an entertainment focused tourist website called agendasancristobal.com but it is a far cry from what we are doing and is not focused on promoting culture-based programs, individuals or organizations. In addition, their advertisers include a small subset of the local businesses, whereas our site will be accepting and promoting all businesses including those who are not tourism or entertainment focused. Please click here to see the site, and thanks for your interest!